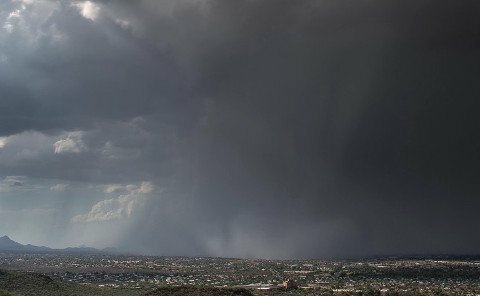 A time lapse video of a microburst showering Tucson with a wall of wind and water could be the best example of the weather phenomenon ever caught on film. Videographer Bryan Snider captured the microburst earlier this summer and posted the time lapse to Vimeo. Since then the video has now gone viral with news outlets around the world picking it up. A microburst is caused when cold air suddenly drops to the ground, expanding in all directions. The wall of wind and water can reach speeds in upwards of 60 miles per hour. Thankfully everyone in this Tucson neighborhood is okay, although very wet.